The good people over at Frangelico sent me a bottle of Frangelico to work into a recipe, and after several trials (mediocre brownies, subpar tiramisu) I finally made an actually delicious tiramisu. What I like best about this recipe is the lack of egg yolks in it – I know it’s not authentic, but it also means I don’t have to deal with a bunch of egg whites and worry about contracting salmonella. After all, I do make dessert primarily for one – the longer that dessert stays in the fridge, the iffier it gets. 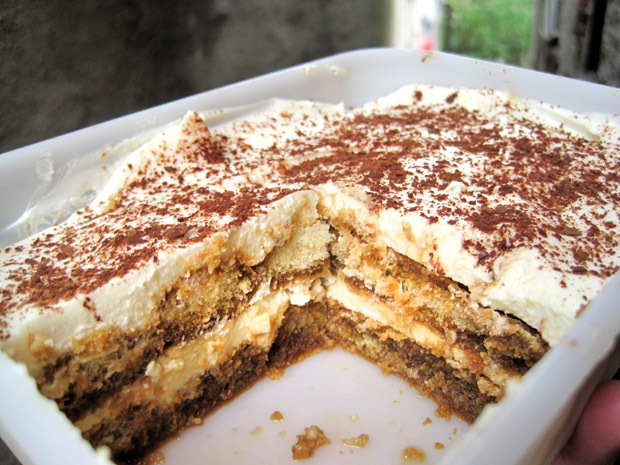 The sad part about having to experiment with flavors is that I had to eat tiramisu every single day for lunch – while not a bad deal by most accounts, even my sweet tooth got a little tired of it. I’m glad I succeeded with a modification of Baking Bites’ recipe. The cheese and heavy cream filling was light and airy, and the strong coffee I brewed coupled with the Frangelico gave it a sweet, nutty complexity. I had attempted another recipe that involved cream cheese in the filling, and while it was okay, I found the cream cheese flavor cloying and not very traditional. This tiramisu recipe is really delicious stuff, and the perfect sort of thing to make when you don’t want to crank up the oven heat in warm weather. In a large mixing bowl, beat mascarpone, sugar, heavy cream and vanilla at high speed until mixture is fluffy and very smooth. In a small, shallow bowl, combine coffee and Frangelico. Dip each ladyfinger into the coffee mixture to let it soak up some of the liquid (2-3 seconds) and place in the bottom of a 8×8 or 9×9-inch baking dish. The bottom of the pan should be completely covered with the ladyfingers in a single layer. Do not completely soak the ladyfingers in the coffee mixture.